Have you ever known someone and then realized you don't really know them at all? I've had a lot of friends in my life — some I feel I know on an intimate level, where they're pretty much open books. But there are some people in my life that I thought I've known, only for them to turn around and do something seemingly out of character. The worst part is that this hurts more the closer you are to someone. Nick, Jess, Schmidt, Winston, and Cece pretty much know one another inside out at this point. They've walked through a lot of stuff together — deaths of loved ones, marriages, break-ups, games of True American. But what I appreciate about New Girl is its realism. It reminds us that not every character on this show knows every other character intimately. Unfortunately, Nick realizes this firsthand in "Misery" when he realizes he doesn't know the woman that he's dating. Like, at all. And Regan makes little effort to make herself known or vulnerable to Nick. She hides something pretty big from him, and we see him get rightfully upset. In the vein of secret-keeping, Winston's mom comes to town and Winston asks Aly to lie to her since she doesn't know they're both cops. In Portland, Jess attempts to hide out at her dad's house and avoid her feelings for Nick. And as all of this unfolds, Schmidt and Cece watch it happen, hilariously serving as this week's Statler and Waldorf-esque stand-ins. Let's dive in, shall we? I love that the main thread of this week's episode was about communication. Jess hasn't communicated her feelings to Nick, or anyone else besides Cece recently. As a result of her healthy decision to put distance between herself and Nick, however, Jess just runs away and hides from her problems in Portland. Under the guise of taking care of her dad, Jess obsessively focuses on staying Portland -- far away from Nick and Reagan's relationship. Because she took care of him the entire episode, Bob vows to take care of Jess after he realizes her real reason for being there. It's sweet, and the episode description for next week seems to suggest that he helps her deal with her feelings for Nick (which I'm a fan of). While putting distance between you and someone else because it's unhealthy is good, Jess' decision to run away from her feelings and hide from the things that are difficult is not. She learns that a bit in the episode, and I think that with time spent between her and her father, she'll return to California with more confidence and strength. Schmidt and Cece spend the episode at the loft, and the running gag that they don't live there anymore is played up quite a few times in the episode. I loved it each time. Because obviously Schmidt and Cece are going to be lonely without the shenanigans and antics of the loft and their friends. In order to participate (or observe, as this week proved), they need to be present. Interestingly enough, the married couple causes issues for Nick — which actually turn out to be beneficial in the end -- but serves as the major commentary for Winston and Aly's stories. 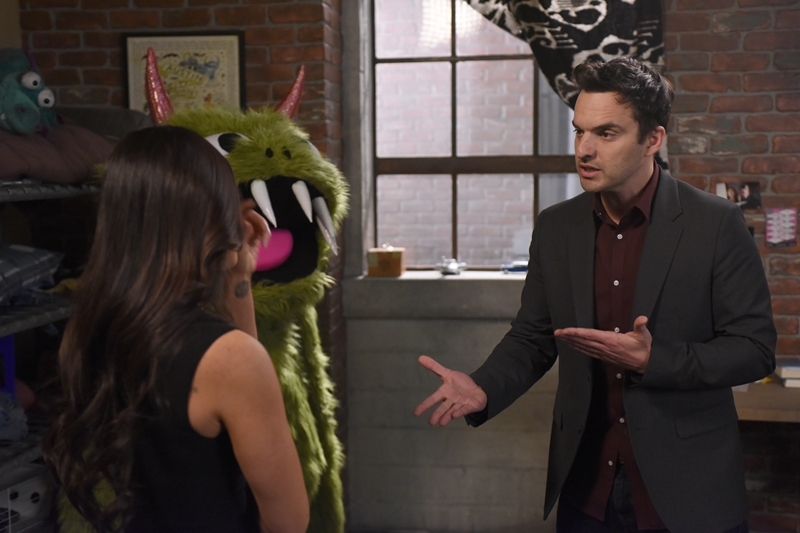 Apart from their hilarious meddling, Schmidt and Cece don't have much of a story this week. But man, their meddling game was strong. So let's talk about meddling, shall we? In "Misery," Reagan is preparing to go to a party with all of her pharmaceutical rep friends, and doesn't invite Nick. Initially, the two think nothing of this. But Schmidt and Cece raise the question of why the pair doesn't do more couple-y things, and why they seem to be okay with only letting one another into part of their lives. So Reagan invites Nick to the party, and he goes. But it's awkward once they're there because Nick realizes he doesn't know anything about Reagan. She keeps her life closely guarded. And she keeps her past even more closely guarded. But what's so striking about this — and the reveal that Reagan was offered the position of VP in her department, which would mean traveling constantly — is that Nick actually is affected. He wants more than just pretending he doesn't care about being all "relationship-y" with Reagan. Nick wants conversations and dates and a real, honest, open relationship. When I say that this is striking, it's because it means Nick Miller is growing. He's no longer content to coast in a relationship that's just okay — one in which he's pretending to be fine. Nick and Reagan might have begun their relationship as those "too cool to care" people, but something has changed in Nick. He wants MORE. He wants it all: the ups and downs and intimate parts of a relationship. Most of all, though, I think he wants communication. He's genuinely hurt by the fact that Reagan held something so huge and important in her life back from him. And I don't blame him. He needs more than just a woman to occasionally hook up with. He needs trust and openness in his relationship. And it seems that, by the end of the episode, Nick realizes that Reagan might not be who he needs. I absolutely love this character growth in Nick — the fact that he called Jess because he missed her and needed her advice, and the fact that Nick is self-aware enough to recognize the fact that his relationship with Reagan isn't healthy or fulfilling anymore. Deep down, I think Reagan was always meant to be a free spirit and she's unwilling to change for a relationship — she wants low-key, low-commitment, and low-transparency. Not Nick, though. Nick is ready for the deep stuff. 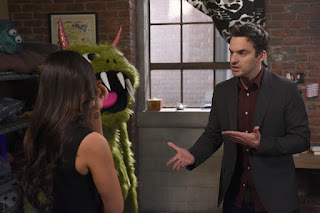 And even though he and Reagan seemingly make up by the end of the episode, Nick confesses to Schmidt and Cece that he thinks their relationship might be close to ending. Just in time for the season finale and a Nick/Jess reunion, right? I think New Girl has done a really excellent job of reconstructing this pairing: they've allowed us to see Jess' feelings and the Nick/Reagan relationship from her eyes. They've allowed Nick to grow as a character and person, and have given him the chance to see what a true relationship should look like. It's the perfect foundation for a second (and hopefully permanent) resurrection of the Nick/Jess romance. Both characters are finally at places in their lives in which they're ready to start thinking about the future. I am so proud of Nick for doing what's uncomfortable and right instead of settling for something that's comfortable just because he likes Reagan. Ultimately, the fact that communication played such a huge role in "Misery" seems important. We can't have good relationships unless we communicate what we want, and — even more so — what we don't want. Speaking of communication, our B-story involved Winston keeping up the elaborate lie to his mom that he's still a radio host. Aly has to go along with the facade, but eventually caves and tells Winston's mom. She's super supportive, but then upset when Winston confesses the same. Turns out, Winston's dad was a cop. His mom was just transferring all of her protective energy onto Winston, growing up. She eventually is happy that Winston is a cop and gives him Winston's father's old badge. Having Jess isolated from the gang is always a risk, but I think "Misery" was a good example of how New Girl can do this effectively — she wasn't the A-story, and hers tied into the major story arc (Nick/Reagan) without overwhelming it. "We don't gab like a couple of Italian grandmas hanging laundry." "My BLOOD built this loft." "I thought you two moved." There were so many references and jokes, and I loved them all. I LOVE THAT THE DISCOUNT STORE IS CALLED BB-TAX. My favorite recurring joke is that Nick and Cece aren't close friends. In this episode, Cece calls Nick and he answers very formally because he (hilariously) doesn't have her number saved in his phone. Winston's dad also used to be a cop! Awwww.